Is Second Life a Game? To my way of thinking, the answer is no, but I think the question merits discussion. Certainly, Second Life is an activity engaged in for diversion and amusement, so that broadest definition of game could work. However, for a great many of us, it is the third definition that comes to mind when one says “online game.” An expectation that there is a goal, something that defines winning, and a set of rules one plays by against other opponents or a game engine. 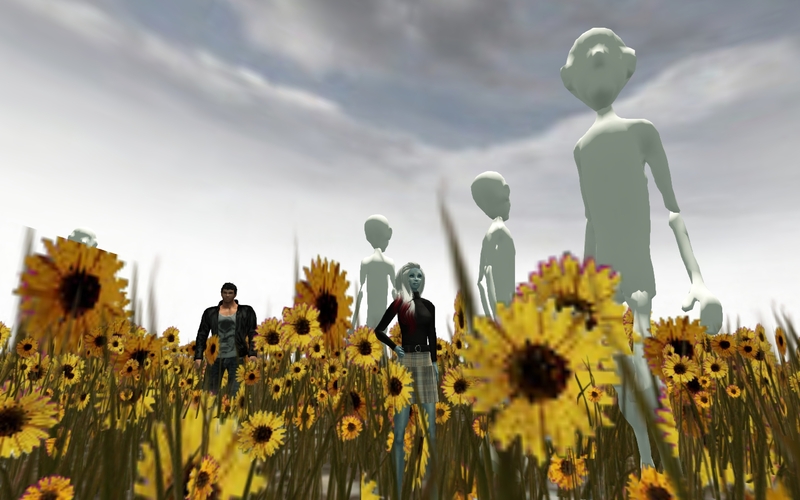 Second Life is an online virtual world where residents do many things. There certainly are games, everything from chess, to combat sims with first person shooter games. Roleplay sims — some of these are really an exercise in living in a certain time period, and the residents create the story together. Others of them have elements of combat at particular points. There are communities of people drawn together by common interests in making and building things. (skins, bodies, houses, castles, furniture, trees and plants, clothes, art). Event planners like the Wayward Event group (Flickr images of their Carnival are truly beautiful). There are folks who are really there for music, dancing and socializing. Writers – Windlight Magazine is a great example. Business. A number of people enjoy making money from the things they create. And there are the “land barons” who definitely derive profit from renting space to other residents. I think of Second Life as the first really successful experiment in creating a small metaverse. An experiment moving towards a true Metaverse. Josh McCormick’s definition of the Metaverse is simple: “Interconnected experiences in a virtual environment . . . and an experience is an environment that contains your presence (for a more thorough explanation, read What is the Metaverse?). I listen to NPR (National Public Radio) on a regular basis, and when they did a story on Second Life in November of 2006, I thought . . . “oh, that’s what that crazy man was talking about last January.” I finally went into Second Life myself in April of 2007 when I was doing a report on new technologies and their uses in education. I was truly overwhelmed with what I found. It was not a game. One more definition to throw out there, this one for social media. “Social Media: forms of electronic communication through which users create online communities to share information, ideas, personal messages and other content.” Second Life has some aspects of social media, but the huge thing it is, that social media is not — at least not necessarily — a shared experience. It’s very often asynchronous, which is fine. I have a busy regular life, but I enjoy the time I spend in-world. Yesterday, I met up with a new friend. Inside the art installation, Dreamers, by Cica Ghost in Second Life. We went to see the Cica Ghost’s Dreamers installation and then dancing. We had a great time talking politics, and many other things, from Percy Shelley to crazy folks we’d run across in Second Life. And I would have to say, it was more fun than binge watching Breaking Bad. Well . . . at least as much fun. So this is Francesca, signing off from her home in the it’s-not-a-game realm of Second Life. I need to go feed my virtual cat. This is an awesome post. You have so nicely analyzed your points that I understand them clearly. Maybe you remember that I had these questions when I first interacted with you(Metaverse and Second life)–I feel now I understand them. Thanks for sharing this wealth of concepts.